I am so not here for holidays skipping over each other. Like, Halloween is this Friday and my local drugstore already has their Christmas stuff up! It’s absolutely crazy! The wall of Christmas lights and a small assortment of ornaments are right next to the Halloween candy. Don’t get me wrong, I love Christmas but let the other holidays have their time in the spotlight! With that said, let’s talk about Halloween. Even though I don’t celebrate it like I used to when I was a kid, I still get excited this time of year. Mostly because holiday season begins with Halloween, but also because CANDY! As evidenced by this blog, I have an enormous sweet tooth. No matter how hard I try, I can’t give up the stuff. Whether it’s candy or baked goods, I’m eating it. Can you believe I almost gave up candy and sweets for good? It was a very dark time in my life. I’m just glad I saw the light. Despite the fact I can’t eat candy or sweets like I used to, I still enjoy a variety of sweets. I love it when Halloween rolls around because there’s SO MANY options. Halloween’s one of the big candy holidays, up there with Easter. I love seeing all the seasonal offerings, and every year there’s always something new. The best part is the discounted candy on sale on November 1st. Half off a giant bag of candy is such a steal! One of my favorite Halloween candies is actually candy corn. I swear, I can hear the groans of disgust from here. Yes, they’re insanely sweet and taste of pure sugar, but to me they’re Halloween. I love getting the bags of Autumn mix because it had a bit of everything; regular candy corn, cocoa flavored Indian corn, and candy corn on steroids in the form of mellowcreme pumpkins. Granted, I can’t eat as many as I used to but I still enjoy like, three when I have them. I knew I wanted to make something festive for this year. I planned on taking whatever I made to class with me, but because I didn’t want to subject my classmates to candy corn, I had to get creative. Cookies are an absolute given, so I rolled (ha!) with that. The best thing about sugar cookies is that they’re a blank canvas, both in taste and in appearance. I wanted to stay on topic, so making them bright orange was the best option. This was slightly tricky, as I didn’t have any orange food coloring. Instead, I had to use the liquid ones and make orange out of red and yellow. First of all, the directions on the back of the box are a lie. I used the same ratio of red to yellow to make orange and ended up with a pink dough instead. Appalled at the fact that I made pink, I kept adding drops of red and then yellow to get orange. Took me what felt like forever, and a lot of color drops but I got it. 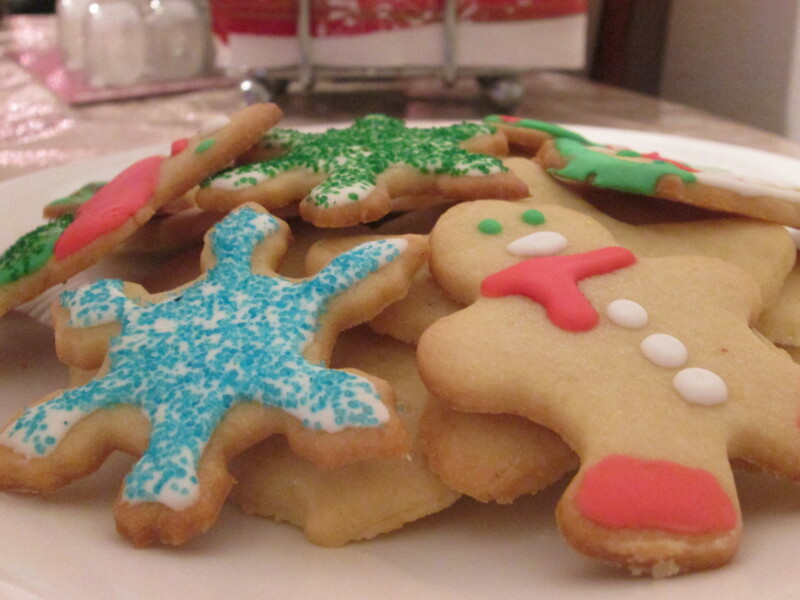 The second best thing about sugar cookies is that they can be made ahead. SUCH a good time saver, let me tell you. I have been insanely busy these past few weeks and barely have time to bake. I make it a point to bake as much as I can when I have the chance, but usually aim to do it on days I have class. I love treating my classmates to baked goods, especially when they’re really appreciative and genuinely love what I bring. Makes me feel all warm and fuzzy, to be honest. The problem is that I don’t have much time to bake on days I have class with the whole gang. My inner lightbulb went on (or off?) when I realized slice and bake cookies were the way to go. Let me just preface by saying slice and bakes never really worked for me. I’m a drop cookie kinda girl, and all this extra work for a cookie seemed overwhelming. That, and the cookie dough never worked for me; it was always too soft, despite it spending time in the fridge. I went for it anyway and was very pleased with the result. I made the dough the night before and baked them off the next morning. They were absolutely adorable! I was so happy to see the swirl came out. I was even happier when I tasted the cookie. Sugar cookies to me always taste like butter covered in sugar. I guess they kind of are, but these cookies tasted like a real cookie and not like sugared butter. My classmates loved them, and so did my sister! The cookies didn’t last long in class, and all the cookies I had at home were gone within a day. 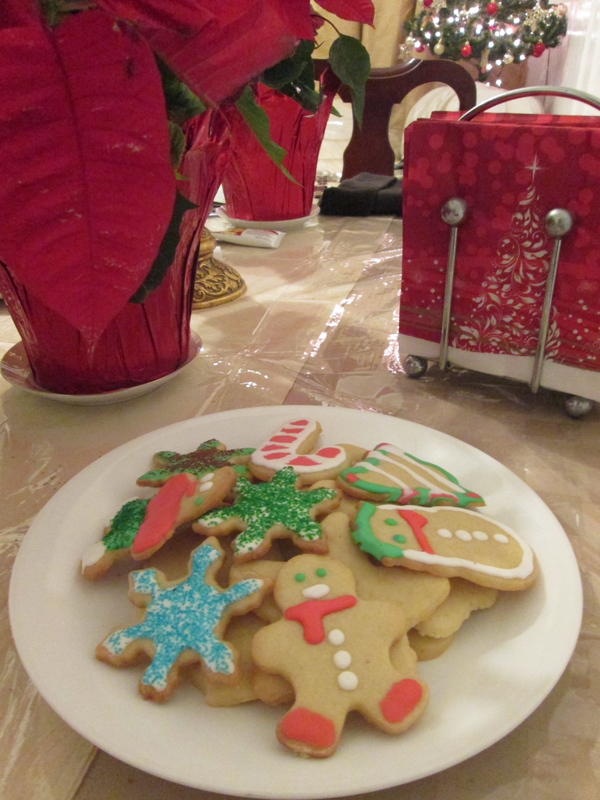 They reminded me of the Pillsbury cookies that come out for the holiday seasons. You know, the ones with the pumpkins or Christmas trees on them? Either way, these were crumbly, sweet, and delicious. In another large bowl, beat the butter until smooth with an electric mixer for about 2 minutes. Add the sugar and continue beating until the mixture is light and fluffy, about 3 more minutes. Add the eggs one at a time, beating between each addition, then add the vanilla. Keep the remaining piece of dough in the bowl, and add in the food coloring, drop by drop. Mix the food coloring into the dough with a rubber spatula, until it reaches your desired color. 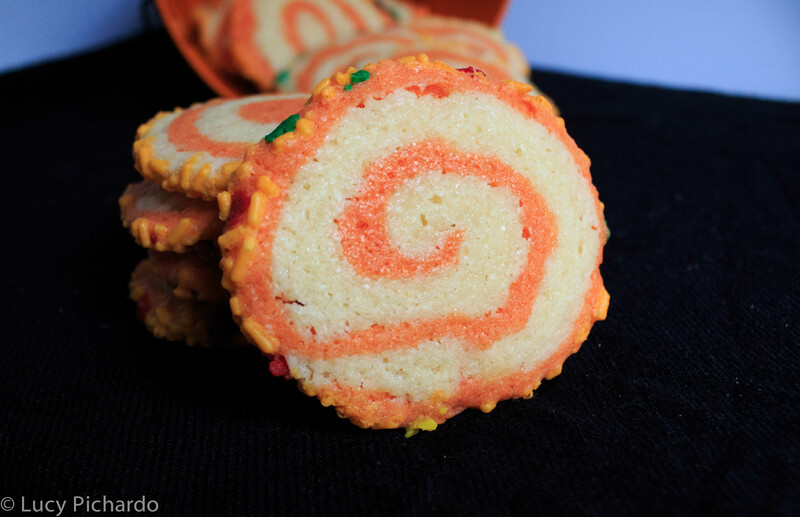 Remove the colored dough, and shape it into an 8-inch square. Wrap it securely in plastic wrap and place it in the fridge. Refrigerate both doughs for 30 minutes. Remove the dough from the fridge and cut each square in half to form two rectangles. Wrap half of each color of dough in plastic wrap and return it to the fridge. Place the white dough in between two pieces of wax paper and roll it into a rectangle about 1/8-inch thick. Roll out the colored half of dough between two separate pieces of wax paper until it is a rectangle about 1/8-inch thick. Peel the top layer of wax paper off of the white dough and then peel the wax paper off one side of the colored dough. 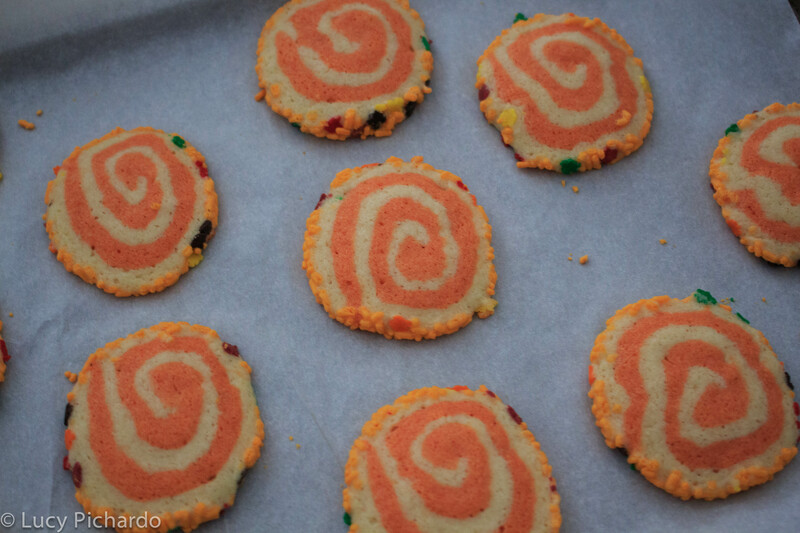 Use the other side to transfer the colored dough on top of the white dough. Very lightly roll the two layers together. Starting at the shorter end of the rectangle, roll the dough as tightly as possible into a log. Repeat the rolling and stacking process with the remaining dough in the fridge. Wrap the logs in wax paper and then plastic wrap and refrigerate them for 1 hour. Remove the dough logs and roll them on the counter several times so they don’t develop a flat side. Unwrap the dough logs and place the sprinkles in a large, shallow dish. Roll the dough logs in the sprinkles until they are completely coated. Re-wrap the dough logs in wax paper and plastic and refrigerate them for 4 more hours. When ready to bake, preheat the oven to 350ºF and line two baking sheets with parchment paper. Remove the dough from the fridge and slice each log into 1/4-inch rounds. 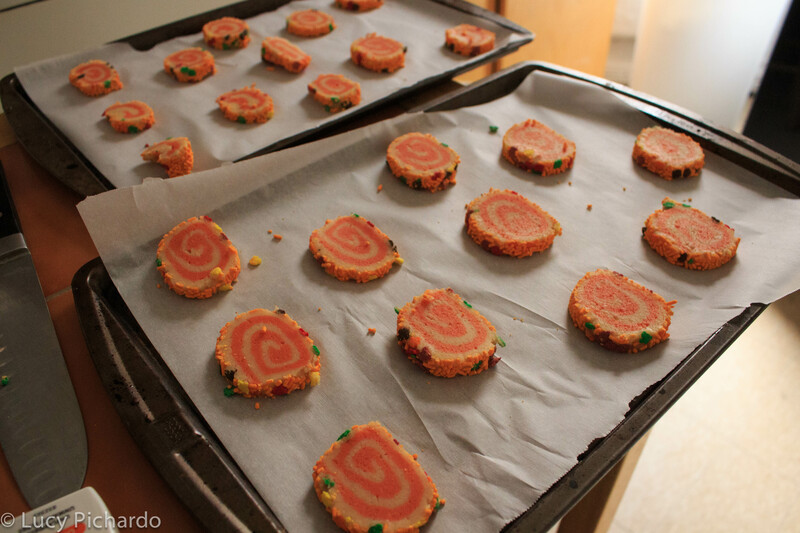 Place the rounds about 2 inches apart on the baking sheets, as the cookies will expand when baked. Bake the cookies for 9 to 11 minutes until pale golden, and then transfer them to a rack to cool completely. These cookies really are a blank canvas and can go really well with many flavorings. Orange zest would’ve gone well with these orange cookies! I threw a bit of rum (whiskey, actually) into my cookies just for kicks. Not sure if it was detectable but I knew it was in there! December is the month of cookies. I have been patiently waiting for this month, even with the unwanted onslaught of all things Christmas since November 1st. Cookies are a traditionally a December thing, and I wanted to get in on the action. When I started baking, I mainly stuck to cakes. Cookies looked so easy and alluring; it was something I had always wanted to conquer. I would fawn over perfectly frosted cut outs, garnished with shiny sprinkles of colored sugar, desperately wanting to make some gems of my own. What took me so long to finally take the plunge? Butter. Now, let me explain. In my house, we don’t use real butter. My family swears off of margarine, and it is and always has been the “butter.” I knew about the real stuff, but didn’t think it made a difference. Whenever I made a cake that called for butter, I just used the margarine. It would still come out good, so I never really gave it much thought. I had somehow formed a bit of fear over butter. I mean, it’s a stick of fat that’s solid when cold, and not when warm. Don’t even get me started on shortening; that’s a fear I am just NOT ready to conquer. I recently decided to overcome my fears and began to bake with butter. I started out slow, and quickly realized that there is a huge difference. Butter is made out of the milk fats found in milk or cream, as opposed to margarine’s oil. The key factor to this stuff, besides the fact that it’s not all vegetable oil, is that its solid when cold and spreadable when warm characteristics are crucial to baking. Especially with cookies, you need the butter to be cold so that the cookies can hold their shape; something I never realized when using the always soft margarine. I don’t know how I got through many years of baking without it, but I quickly saw the error of my ways and am glad I let butter into my life. I sound crazy saying it, but believe me; the difference is that big. So now that I have real butter stocked in my fridge regularly, I was ready to take on some cookies. These sugar cookies are Bon Appétit’s “ultimate.” What makes them ultimate? In BA’s own words: the cookies are “crisp yet tender, keep their shape when baked, and taste great too.” With that description, I knew this one was a good start. I mean, a recipe that has not one, but two and a half sticks of butter in it has to be good. Making the dough was tricky for me because as most of you know, I do not own a stand mixer. Now, you don’t necessarily need one but this process will be eons easier if you have one. I tried to use my trusty old hand mixer for this, and ended up messing up one of the functions. I’m not ready for my only mixer to kick the bucket, so I proceeded with the rest of the recipe by hand. It takes a bit longer but it does come together. 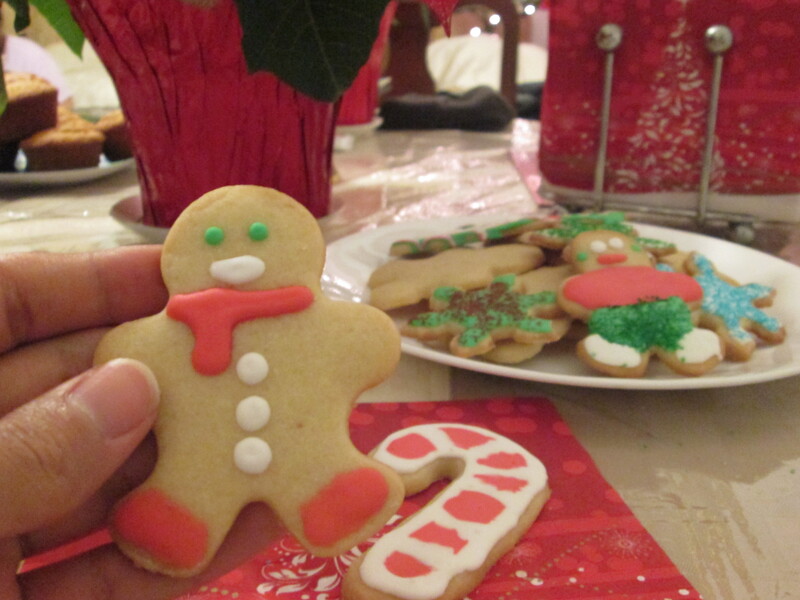 My sister and I had fun decorating and eating these cookies. Even though we may not be artistically inclined, we had a blast channelling our inner Picasso. The cookies definitely held their shape when baking, and were exactly as described; crisp and tender. Even when iced with royal icing, the cookies weren’t overwhelmingly sweet. I baked off half the batch, and am already looking forward to baking off the rest in the coming weeks. Place racks in lower and upper thirds of oven; preheat to 325°. Whisk salt, baking powder, and 3 cups flour in a small bowl. Using an electric mixer on high speed, beat butter and sugar until well combined (butter does not need to be fluffy), about 3 minutes. Alternatively, you can whisk the butter and sugar with a whisk. Add egg, egg yolk, and vanilla; beat just to combine. Reduce speed to low, or switch to wooden spoon or rubber spatula, and gradually add dry ingredients; mix just to combine. Form dough into two ¾”-thick disks; wrap in plastic. Chill at least 2 hours. Let 1 disk of dough sit at room temperature until softened slightly, about 5 minutes. Roll out on a lightly floured sheet of parchment paper until about ¼” thick, dusting with flour as needed (if dough gets soft or sticky, chill on parchment until firm). Cut out shapes with floured cookie cutters; transfer to parchment-lined baking sheets. Pop your cut outs in the fridge between batches, so cookies won’t spread when baked. Bake cookies, rotating baking sheets (switch sheets from top to bottom racks, and rotate 180 degrees) halfway through, until edges are golden, 12–16 minutes, depending on size. Transfer to wire racks and let cool. Repeat with scraps and remaining dough. 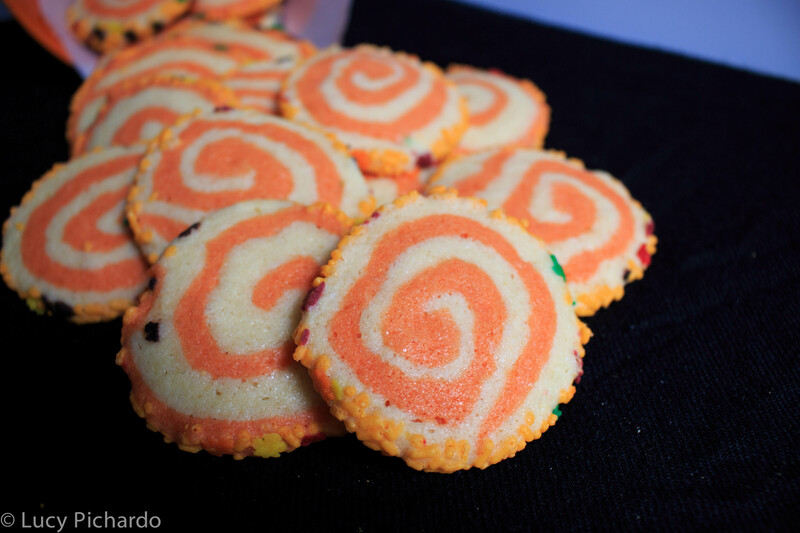 Decorate cooled cookies as desired. Using electric mixer, beat 3 1/4 cups powdered sugar and egg whites until thick and shiny, adding more powdered sugar by tablespoonfuls if mixture is too thin to spread, about 3 minutes. Add lemon juice. Divide icing into portions, if desired, and add different food coloring to each. Cover until ready to use. I added about two teaspoons of lemon zest to my dough, for added freshness. The taste is subtle and brightens up the cookies. It’s totally optional but if you want more of a lemon punch, add in a couple teaspoons of freshly squeezed lemon juice along with the zest. When cutting the cookies out, it’s important to keep the dough cold or they’ll spread out. If you’re waiting to put in two complete trays in the oven at the same time, put your cut outs in the fridge until ready to bake. I learned this one the hard way. If your dough gets too soft when rolling and cutting, pop it in the freezer for a couple of minutes for a quick chill. For the icing, make sure it’s not too thin or it’ll run off your cookies.